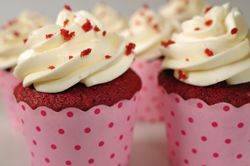 Everyone seems to enjoy Red Velvet Cupcakes covered with lovely swirls of Cream Cheese Frosting. While a year round favorite, their red and white color scheme make them particularly well suited for Christmas, Valentine's Day, and Canada Day. Top each cupcake with a fresh blueberry and you have a festive red, white, and blue dessert for July 4th. Red Velvet Cupcakes have a mild chocolate flavor that comes from adding just 1 tablespoon of unsweetened cocoa powder (regular or Dutch processed) to the cake batter. Although they say that the reaction between cocoa powder and baking soda gives a red tinge to the batter, to get the garishly red color of a Red Velvet Cake, we need to add lots of liquid red food dye (about 1 tablespoon). Buttermilk is responsible for this cake's moist and tender crumb. You can buy buttermilk or buttermilk powder, or you can make your own by adding 1 tablespoon of white distilled vinegar, cider vinegar, or lemon juice to 1 cup (240 ml) of milk. Just let this mixture stand 5 to 10 minutes before using. The cake batter uses the creaming method, that is, beat the butter with the sugar until creamy, add the egg and vanilla extract, and then alternately add the flour mixture and buttermilk (mixed with the liquid red food dye). The final step is to add a mixture of baking soda and vinegar. Because baking soda starts to react with the batter right away, try to get the cupcakes into the oven as quickly as possible. Finally, the frosting, which is really what cupcakes are all about. The classic frosting for a Red Velvet Cake is cream cheese. But this cream cheese frosting is a little different in that it also contains heavy cream so you end up with a sweet yet tangy frosting, that is wonderfully rich and creamy. Make sure to use cold heavy cream or heavy "whipping" cream (double cream) which is cream with a 35-40% butterfat content. This is cream that when whipped, holds stiff peaks. The frosting recipe is adapted from 'The Waldorf-Astoria Cookbook' by John Doherty. If you are just spreading the frosting on the tops of the cupcakes with an offset spatula or knife I would half the Cream Cheese Frosting recipe. But if you want to pipe lovely tall swirls (I used a Wilton 1M star tip) of frosting on top of each cupcake, use the full recipe. If you like, crumble one of the cupcakes, and use the crumbs to decorate the remaining 11 cupcakes (as I have done in the picture). Cream Cheese Frosting: In the bowl of your electric mixer, or with a hand mixer, beat the cream cheese until smooth. Add the vanilla and confectioners sugar and beat until smooth. Using the whisk attachment, gradually add the heavy cream* (See Note) and whip until the frosting is thick enough to pipe. Add more sugar or cream as needed to get the right consistency. Note: You must use a brand of heavy cream that whips very easily to stiff peaks. If you are using a brand of heavy cream that does not whip easily to stiff peaks then whip the heavy cream separately to stiff peaks and then fold it into the cream cheese mixture.